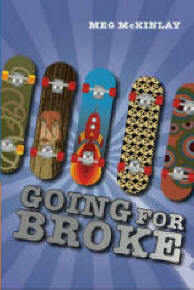 Today, I’m launching my new book, Going for Broke. Sadly, you are not invited. But don’t take it personally, because no-one is invited. This time around, I decided that a launch party was beyond me. That doesn’t mean that the book isn’t launched, though. In fact, I’m launching it right here, right now. Imagine, if you will, some hardwood floors, some overstuffed couches, a balcony overlooking the street. Picture a room full of enthusiastic friends and some random people who just wandered in from the Fremantle night. Imagine some gourmet pizza, a bar in the corner, a ‘kids table’ left sadly unappreciated while my target audience instead heckle passers-by from the balcony. Imagine me in a corner signing books all night, pausing only for a brief moment of bewilderment as a relative picks up a book, retreats several feet away to flick through it, frown, and then returns to replace it on my pile. For the aftermath, imagine relief, elation, exhaustion, lots of washing up, and a stream of unflattering, poorly lit photos causing much email hilarity the next day. A nd so I declare you launched, little book, with virtual fanfare and fireworks and all other kinds of second-book goodness. There! That was fun, wasn’t it? I hope you had a good time. I know I did. * If you’re wondering where these ‘virtual launch’ details came from, see my Annabel, Again launch notes from around this time last year. This entry was posted in Going for Broke, Lightning Strikes and tagged launches on May 1, 2008 by Meg McKinlay.